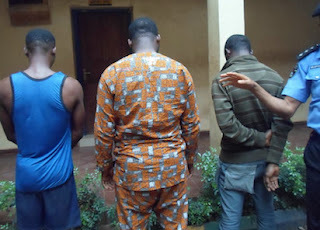 5 policemen in Ebonyi have been arrested and placed on Orderly room trials for allegedly aiding the escape of a murder suspect, one Ogonna Alioka aka “Pilot” and three other suspects of various offences from the Police Cell in the state command. The state’s police Commissioner Titus Lamorde told journalists in Abakaliki that the Ogonna was one of the fifteenth suspects arrested for their role in the abduction and murder of one Mrs Chukwu Okorie. He said the victim was kidnapped on January 8, 2017 in her home at Egba Amanye community in Ivo LGA of Ebonyi state and was murdered and buried in a shallow grave at Lopkpanta forest in Abia state. Mr Lamorde said all the policemen on Counter duty on the day the suspects were arrested, detained, defaulted and tried in an orderly room. police is 1 one the problem we have in naija, no security.